We take customer satisfaction very seriously at Edward Green and want you to have a shoe that is in every sense the perfect fit. We offer a free return service for all non-made-to-order goods within 14 days of delivery or collection. Contact us at customercare@edwardgreen.com or arrange a return through the my orders section of the website — or return to our London store. We’ll supply you with a “Returns Merchandise Authorisation (RMA) number” to use in conjunction with our shipping partner DHL. You must then arrange for the goods to be collected by DHL for return within 14 days of receiving your RMA number. 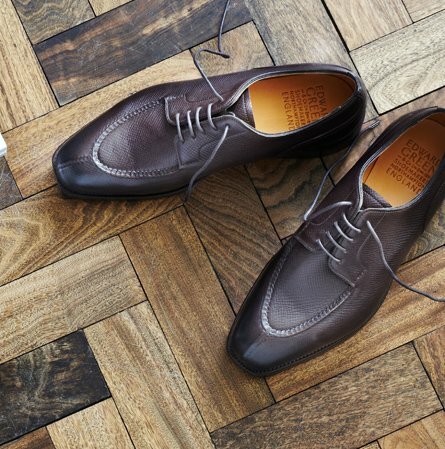 We’d recommend that you ensure your shoes fit to your satisfaction on a carpet before wearing them outside or on rough surfaces as all returned goods need to be in perfect condition, and come with their original packaging. Unfortunately we will not be able to accept returns if they are not in perfect condition. If you wish to exchange an item, please return the item you no longer wish to keep and place a new order. Unfortunately shoes and accessories made to order cannot be exchanged or refunded. We will process your return within 48 hours of receipt. You will receive a confirmation email and, provided the conditions of return are met, we’ll refund to the card used for the original order. If you choose to return goods using our free collection service, we do not refund the original shipping costs. Typically payments will show on your records within 72 hours of being processed but can take up to ten days. If you wish to make any changes to your order contact us as soon as possible and, provided we haven’t dispatched the order, we’ll work with you to make any requested changes.